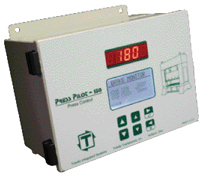 The Press Pilot 150 from Toledo Integrated Systems, Holland, OH, can be used as a stand-alone control or integrated with other automation equipment such as tonnage monitors, die protection, programmable limit switches and PLCs, for maximum flexibility. Dual processors provide the necessary redundancy and control reliability that meet or exceed ANSI B11.1, OSHA 1910.217 and CAN/CSA-Z142-02 standards. Simple integration can be accomplished with one of the firm’s TPC (total press control) packages: DPPlus TPC, Press Attendant TPC, Co-Pilot TPC or Maximizer TPC. Features of the Press Pilot 150: plain-English fault/prompt messages, Ethernet connectivity, brake monitor and inputs for as many as four operator stations. For ease of installation and to address a variety of applications, the control can be configured to be resolver-, encoder- or cam-based.